Kitchen Cabinets and Granite Countertops, Pompano Beach FL > Blog > Blog > Is The Breakfast Nook a Thing of The Past? Is The Breakfast Nook a Thing of The Past? Is the breakfast nook a thing of the past? Absolutely not! Kitchen nooks are still in style from the modern banquette to the classic corner breakfast nook. No matter your nook style, they offer coziness and style that promises to increase the value of your home. 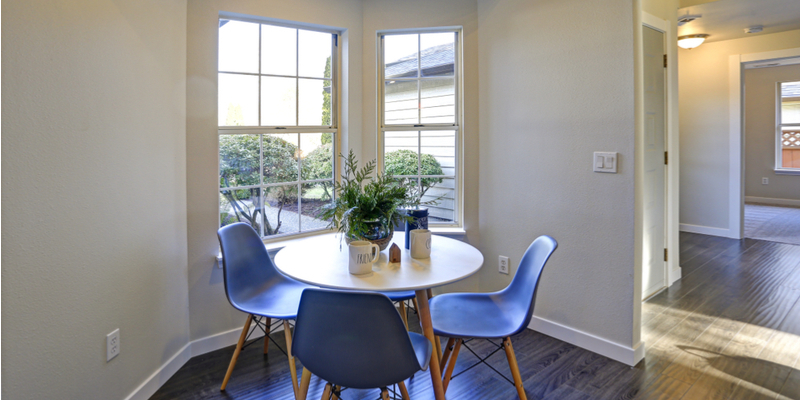 Breakfast nooks are the ideal spot for family breakfast and dinner as well the perfect place for homework, games, and other activities which bring the family together. Let’s explore today’s favorite breakfast nooks from the simple to the elaborate. Built-in kitchen nooks are certainly a classic favorite whether you chose the corner L-shaped version or the traditional two bench design. Both are common DIY projects, but in today’s new homes designers are coming on board with modern designs. Corner nooks require the most space, while the two bench version can fit into a smaller space. The bench style built-in nooks often make use of windows in the space, effectively providing light and an open, spacious feel. Natural wood seating is a favorite choice for built-in nooks which often save space in a one of the busiest places in the house. If no window is available, wall paper can add light and whimsy to a breakfast nook. Pendant lighting in the kitchen nook can add unexpected style in any home. Corner nooks were originally a focal point in traditional kitchens, but today they are finding their way into modern homes and delivering trending style all their own. Corner nooks often feature soft padded seats, chairs, and table. These trending nooks have added features like built-in shelving, storage seating, and other options which make them an extension of the kitchen itself. Many of today’s corner nooks feature luxury features like velvet or leather seating, bold color palettes, and more. The classic kitchen nooks have been the inspiration for today’s bolder dining nooks which feature fireplaces, walls acting as room dividers, and more. These dining nooks offer larger areas with oversized tables, built-in shelves, custom seating, and distinct architectural features not seen in classic nooks. Showcasing features like custom glass pendants, leather seating, wood stoves with wood storage, and partial or floor to ceiling divider walls, bold modern kitchen nooks make a statement whether your design is minimalist, sleek, functional, or downright intrepid. Picture your favorite cozy café booth and you’re well on your way to creating a banquette kitchen nook. Perfect for having your morning coffee, or sharing a morning meal with the family, banquettes aren’t boring! A classic banquette nook offers seating for two, but today’s modern versions offer roominess for four with the addition of coordinating chairs. Like built-in bench nooks, banquettes often feature a large window to open the space and add light. Banquettes can be simple decorated with classic complimentary colors or bold contrast, or they can offer unexpected touches like semi-circular seating, coordinating rugs, and circular tables. Breakfast nooks, also known as kitchen nooks or dining nooks are not a thing of the past, but rather a great addition to any modern kitchen space. Kitchen nooks add a unique design element allowing homeowners to effectively utilize space while showing off their personal kitchen style.